Breathtaking views, vibrant culture, and 49 square miles of family-friendly fun. San Francisco, one of the most diverse and unique cities in the U.S., has all this and more. We spent six days exploring the city on foot, by street car and on the water. Be sure to pack for different temperatures; think layers. You'll likely start the day being cold and then warm up quickly while hiking the city’s legendary hilly streets. For the best bang for your buck, purchase a San Francisco CityPASS, and get unlimited access to San Francisco’s historic cable cars, streetcars and buses, as well as admission to four attractions. A GoCard gets you all-inclusive entry to 31 attractions. You can get them online from Costco.ca and save even more. Want to be smack-dab in the middle of everything? Stay in Union Square. Personality Hotels offer great options for families with their Kids Suites. 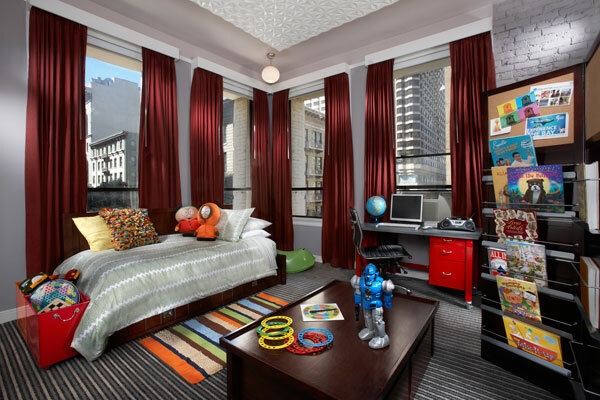 Located one block from the historic Cable Car Turnaround (yes, you’ll hear bells from your room), Hotel Union Square’s retro-style space features a trundle bed, computer games, a Wii, and a curved bookcase separating it from the adult area. Hotel Diva’s Old Hollywood-themed décor has a private kids’ room with bunk beds, plus a karaoke machine, games and crafts. Sit up top of the double-decker bus and enjoy Gray Line’s Open City Tour, where you can hop-on/hop-off at any of the 36 stops. Add on a side trip to marvel at the 800-year-old, 250-foot-high redwood trees at Muir Woods National Monument. Explore the city in a two-seater GoCar, a splurge-worthy GPS-guided ‘storytelling’ car, an exhilarating way to see 200 points of interest, including many that tour buses can’t get to. Ride tandem bikes over the breathtaking Golden Gate Bridge to Sausalito, wander around this quaint fishing village, grab some lunch, and then take the ferry back. 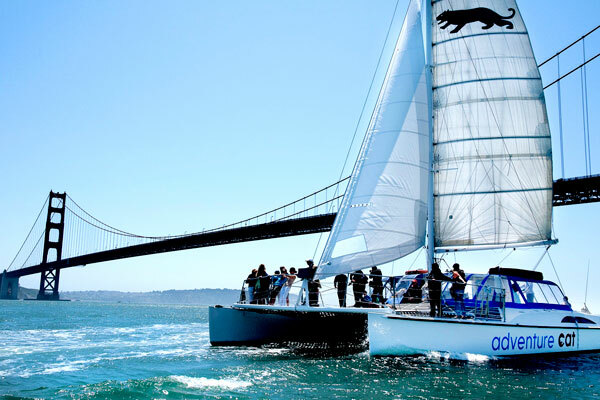 Sail under the bridge and around Alcatraz Island on the Adventure Cat sailing tour. Kids under five sail free. Plan to spend a half-day visiting Alcatraz Island, where’s the nation’s most incorrigible criminals ended up between 1934-1963. The award-winning digital audio tour ‘Doing Time’ – featuring the voices of former prisoners and guards – is terrific. Book your tickets far in advance, and bring warm jackets for the ferry ride over. The least crowded tours leave in the morning; otherwise, you’ll have a bit of a wait in line for the ferry. Hike along Lands End Beach, or walk through Crissy Fields, a former airfield in the Presidio and one of the best spots to see the or play on the beach. Bundle up; it gets pretty windy and cold here. Save some energy for the very steep walk up Lombard Street, the ‘crookedest’ street (and one of the most photographed) in the world. Ride a piece of moving history on the Hyde Street Cable Car. Be prepared for super-long lines if you don’t go first thing in the morning, or walk to the stop at Van Ness and California, which is rarely crowded. Don’t miss the Beach Blanket Babylon’s Sunday matinees at Club Fugazi. Featuring hilarious spoofs of pop-culture characters – plus spectacular costumes and outrageously gigantic hats – it’s the longest-running musical revue in theatre history. Post-show, follow your nose and grab a bite at the Stinking Rose, where they serve garlic, garlic and more garlic. California Academy of Sciences boasts a 4-story tropical rainforest, a swamp, a coral reef, a planetarium and 40,000 live animals and exhibits. Housed in three historic buildings in a former military base, the Walt Disney Family Museum tells the story of the man behind Mickey Mouse, Donald Duck, and Goofy. The Exploratorium, at Pier 15, is world-renowned for its hands-on science, art, nature, and technology exhibits. Walk through clear acrylic tunnels while marine life swims all around you at the Aquarium of the Bay. Then learn about and play with antique arcade machines at Musée Mécanique. Hundreds of barking sea lions migrated to Fisherman Wharf’s K dock at Pier 39 in 1990 – no one knows why, but kids love getting an up-close look at them. Afterwards, enjoy this two-level dining and shopping mecca: Watch the street performers, see how San Francisco’s famous sourdough bread is baked at Boudin Bakery, or ride the double-decker carousel. You can easily spend an entire day exploring Golden Gate Park’s 1,017 acres of lush gardens, playgrounds, walking trails, and historic monuments. Pick up picnic fixings and enjoy the people-watching. Take a free walking tour with SF’s City Guides. No need to reserve; just check the schedule and show up. Blink and you’ll walk right by this teeny-tiny fortune cookie factory, located in a Chinatown alley, where several elderly women craft delicious treats and hand out free samples. They’ll charge you fifty cents if you want to snap a photo, though. See trolley cars in action and watch the giant wheels pulling the cars up and down the city’s famously steep streets at the Cable Car Museum. In the 1960s, local residents fought back against city plans to destroy a patch of open space, and a teenager later designed two long, steep concrete Seward Street Slides, which are for thrill-seekers only – wear sturdy pants, grab a piece of cardboard at the bottom of the slide and go! Hankering for pancakes? Head to Mama’s, but get there early: line-ups are legendary. If you’re staying in Union Square, pop over to the Walgreen’s superstore on Powell, where you can pick up hot breakfast sandwiches, fruit and fresh-squeezed juice to go. For lunch in Sausalito, Napa Valley Burger hits the spot. Or, back in SF, stroll the Ferry Building Marketplace’s many restaurants, specialty food stores, and world-class farmer’s market. Slurp some clam chowder in a sourdough bowl at the Boudin Bakery & Café. Sample authentic fish and chips at The Codmother, where portions are enormous. If you still have room, indulge your sweet tooth with to-die-for chocolate or ice cream at Ghirardelli Square. For kid-friendly dinner bargains, drop into Katana-ya for sushi and ramen. Tasty Thai can be found at Bangkok Noodles, and House of Nanking’s mouth-watering calamari and sesame chicken is a sure bet. Check out one of the city’s fantastic food truck festivals: the SOMA StrEAT Food Park or Off the Grid, where you can try dozens of different ethnic foods while listening to live music. Can’t decide on just one spot? Take a Food Tour! Grub Crawl offers a walking tour to three restaurants in one evening. Chinatown Adventures with ‘Wok Wiz’ is a dim-sum lovers delight and Gourmet Walks offers everything from chocolate sampling to sushi. Wendy Helfenbaum is a Montreal-based writer and TV producer at http://www.taketwoproductions.ca. She is a frequent contributor to Parents Canada magazine.